BACKGROUND AND PURPOSE: 3D time-of-flight MR angiography (3D TOF MRA) may be used as noninvasive alternative to digital subtraction angiography (DSA) for the follow-up of patients with intracranial aneurysms treated with Guglielmi detachable coils (GDCs). We aimed to determine the influence of aneurysm size and location on diagnostic accuracy of 3D TOF MRA for follow-up of intracranial aneurysms treated with GDCs. MATERIALS AND METHODS: Two hundred and one 3D TOF MRAs in 127 consecutive patients with 136 aneurysms were compared with DSA as standard of reference. Sensitivity and specificity of 3D TOF MRA for detection of residual or reperfusion of the aneurysms was calculated with regard to aneurysm size and location. RESULTS: Overall sensitivity and specificity of MRA was 88.5% and 92.9%, respectively. Sensitivity was lower for aneurysms ≤5 mm (72.2%) and ≤3 mm (63.6%). In addition to the small aneurysm size, interpretation of MR angiograms was compromised by susceptibility artifacts at the air-bone interface, arterial overlap, and pulsation-induced artifacts. The small number of disagreements between MRA and DSA hampered reliable interpretation of the possible influence of aneurysm location on MRA accuracy. CONCLUSION: The sensitivity of 3D TOF MRA for detection of reperfusion or residual perfusion of coiled intracranial aneurysms varies considerably depending on the size of the aneurysms. No conclusions can be drawn regarding a possible influence of aneurysm location on diagnostic accuracy of 3D TOF MRA. These findings may influence the decision about whether to replace DSA by 3D TOF MRA for the follow-up of patients with intracranial aneurysms treated with GDCs. 3D time-of-flight (3D TOF) MR angiography (MRA) proved reliable for detection of residual flow in intracranial aneurysms treated with Guglielmi detachable coils (GDC).1–8 Compared with digital subtraction angiography (DSA), a sensitivity of 72%–97% and a specificity of 91%–100% were reported.1–8 In 1 study, TOF MRA was even superior to DSA in visualization of residual flow in aneurysms.9 Therefore, some authors suggest, that DSA at 3 or 6 months after coil placement may possibly be replaced by MRA.4 However, TOF MRA is sensitive to flow-related artifacts, signal loss due to saturation effect at the margin of the slab, overlap of the aneurysm and adjacent arteries, or atherosclerotic changes of the vessel wall.7,10,11 These factors may significantly influence image interpretation depending on the location of the aneurysm.7,8,10,11 Aneurysm size is another factor that may influence the diagnostic accuracy of 3D TOF MRA. Several studies reported a lower diagnostic accuracy for aneurysms smaller than 3 mm and for giant aneurysms larger than 20 mm.3,11–16 However, to the best of our knowledge, no studies have evaluated the diagnostic accuracy of 3D TOF MRA with special regard to the size and location of intracranial aneurysms in a sufficient number of patients treated with detachable coils. Thus, the purpose of the current retrospective study was to determine the diagnostic accuracy of 3D TOF MRA for follow-up of intracranial aneurysms treated with detachable coils in a large number of patients. The accuracy of MRA was evaluated with regard to the size and location of the aneurysm. DSA was used as standard of reference. Between October 2000 and November 2002, 127 patients (89 women, 38 men; mean age, 49.6 ± 11.9 years; age range, 13–74 years) with 136 aneurysms were treated with GDC at our institution. In these patients, 201 follow-up examinations, including 3D TOF MRA and DSA, were available. The interval between endovascular treatment and the correlative MRA and DSA examinations ranged from hours up to 4.9 years. Included were all patients with an interval of less than 3 days between DSA and MRA. The DSA examinations were performed on a biplane system (Neurostar Top, Siemens, Erlangen, Germany; Matrix 1024 × 1024) via transfemoral catheterization and selective injection of contrast media (Visipaque; Amersham Health, Oslo, Norway) into the carotid and vertebral arteries. Imaging was performed in standard and adequate oblique projections as required. The maximum diameters of each aneurysm were calculated on the workstation. MR imaging was performed on a 1.5T scanner (Gyroscan NT Intera; Philips, Best, the Netherlands) equipped with a 3-axis gradient system with a maximum amplitude of 23 mT/m and slew rate of 105 mT/m/s. A standard head coil was used. The examination protocol included a standard T2-weighted spin-echo sequence (TR, 5072 ms; TE, 100 ms; section thickness, 5 mm; FOV, 220 mm), a fluid-attenuated sequence (FLAIR; TR, 6000 ms; TE, 130 ms; TI, 1900 ms; section thickness, 5 mm; FOV, 220 mm), and a gradient-echo sequence (fast-field echo; TR, 733 ms; TE, 23 ms; FOV, 200 mm). For the 3D TOF MRA, the following parameters were used: 3D fast imaging with steady precession; TR, 28 ms; TE, 6 ms; α = 20°, variable flip angles (tilted optimized nonsaturating excitation) and magnetization transfer pulses; in-plane resolution, 0.5 × 0.8 mm; effective section thickness, 0.9 mm; FOV, 200 mm. The first 81 (40.3%) of 201 3D TOF MRAs were performed without application of contrast material. After September 2001, the MRA protocol for examination of coiled intracranial aneurysms included the injection of 0.2 mmol/kg gadolinium chelate (Gadodiamide Omniscan; Amersham Health, Oslo, Norway). The remaining 120 (59.7%) of the 201 3D TOF MR angiograms were thus performed after application of contrast material. The same imaging parameters were used for unenhanced and contrast-enhanced MR angiograms. For each examination (DSA and MRA), findings were assigned to 1 of 4 categories: 0, complete occlusion of the aneurysm; 1, small residual neck (1–3 mm); 2, large residual neck (larger than 3 mm); and 3, not assessable. DSA findings were interpreted on a console by an experienced neuroradiologist who was unaware of MRA findings. For interpretation of MRA, MR source images and 3D maximum intensity projection (MIP) were viewed on an independent workstation (Sparc 10 CT/MR, Sienet MagicView 1100; Siemens). Another neuroradiologist who was unaware of the DSA findings interpreted MRA. A third neuroradiologist, unaware of the readings of the first 2 readers, interpreted both MRA and DSA. For this purpose, DSA images and unsubtracted and subtracted MR angiographic images were displayed on an independent workstation without patient information. A minimum time of 2 months was required between interpretation of MRA and DSA. Consensus was obtained in cases of discrepancies between the third reader and the first 2 readers. The significance of differences in proportions was tested using exact analogs to the Pearson χ2 test statistic. One-way analysis of variance (ANOVA) was used to test for differences of mean aneurysm size between different locations. Bonferroni correction was applied to multiple comparisons. A 2-tailed P value of <.05 was considered to be significant. Statistical analysis was performed by the SPSS statistical package (ver. 10.0; SPSS, Chicago, Ill). MRA and DSA were performed on the same day in 194 of 201 cases. In 3 of 201 cases, DSA was performed 2 days (n = 2) or 3 days (n = 1) after MRA. In 4 of 201 cases, MRA was performed 2 days (n = 2) or 3 days (n = 2) after DSA. Eight (4%) of 201 MRA examinations were excluded from the data analysis because of the long interval between DSA and MRA (ie, >3 days). Findings of 3D TOF MRA and DSA of the remaining 193/201 aneurysms are given in Table 1. Disagreement between the readers concerning the absence or presence of a residual perfusion of the aneurysm neck occurred in 1 of 193 (0.5%) DSA studies and in 5 of 193 (2.6%) MRA studies. These cases were solved by discussion. Five (2.6%) of 193 MRA studies were considered nondiagnostic by the readers. These cases included extensive susceptibility artifacts as a result of an implanted ventricular shunt (anterior cerebral artery [ACA], n = 1), susceptibility artifacts due to surgical clips (middle cerebral artery [MCA], n = 1), and a giant aneurysm with flow artifacts due to turbulences (internal carotid artery [ICA], n = 1). In 2 cases, MRA images were considered nondiagnostic as a result of motion artifacts caused by a lack of patient compliance together with susceptibility artifacts at the air-bone interface in the region of the sella turcica (ICA, n = 1), and pulsation-induced artifacts at the anterior communicating artery (AcomA, n = 1). Subsequent statistical analysis was based on the remaining 188 (93.5%) of 201 MRA examinations. MRA and DSA findings and the corresponding sensitivity and specificity values with regard to the location of the aneurysms are given in Table 2. The overall sensitivity and specificity of 3D TOF MRA in detection of residual perfusion or reperfusion of the aneurysm compared with DSA was 88.5% and 92.9%, respectively (Table 2). Agreement between MRA and DSA in detection of reperfusion of the aneurysms occurred in 54 of 188 (28.7%) examinations (Fig 1). In 9 of 188 (4.8%) examinations, MRA detected a residual or reperfusion, whereas in DSA, no residual or reperfusion was visible (Table 2, Fig 2). In 1 case, a large residual neck was diagnosed in MRA, but DSA showed only a small neck remnant (Fig 3). In this case, partial volume artifacts due to vessel overlap may have caused the misinterpretation. Agreement between MRA and DSA in detection of complete occlusion of the aneurysm occurred in 118 of 188 (62.8%) examinations (Table 2). In 7 of 188 (3.7%) examinations, MRA detected a complete occlusion of the aneurysm, whereas DSA showed a residual or reperfusion (Table 2, Fig 4). In 1 case, a small neck remnant was diagnosed in MRA, but DSA showed a large residual neck (Fig 5). In this case, pulsation-induced artifacts may have caused the misinterpretation. Possible causes for false-positive and -negative findings of TOF MRA compared with DSA are given in Table 3. Agreement in detection of residual flow at the neck of an aneurysm of the anterior cerebral artery after treatment with detachable coils seen on DSA (A, black arrow). Unenhanced 3D TOF MRA (B) and MIP reconstruction (C) showing the residual flow (white arrows) in agreement with DSA. Overestimation of a completely occluded aneurysm of the anterior communicating artery seen on DSA (A, black arrow). Unenhanced 3D TOF MR angiography (B) and MIP reconstruction (C) showing a small residual perfusion at the neck of the aneurysm (white arrows). Overestimation of a small residual perfusion of a coiled aneurysm of the middle cerebral artery seen on DSA (A, black arrow). Contrast-enhanced 3D TOF MRA (B) and MIP reconstruction (C) showing a large residual neck (white arrows). Underestimation of a residual perfusion of the neck of a basilaris tip aneurysm seen on DSA (A, black arrow). Contrast-enhanced TOF MRA (B) and MIP reconstruction (C) showing complete occlusion (white arrows). Underestimation of a large residual neck of an aneurysm of the anterior communicating artery seen on DSA (A, black arrow). Unenhanced TOF MRA (B) shows a small residual perfusion of the aneurysm neck (white arrow). Distribution of false-positive and false-negative findings across the locations, the corresponding sensitivity and specificity values, and 95% confidence intervals (CI) are given in Table 2. The number of false-positive findings (χ2 = 2.2, df = 3, P > .05), false-negative findings (χ2 = 5.6, df = 3, P > .05), and the overall number of disagreements (χ2 = 4.1, df = 7, P > .05) between MRA and DSA did not significantly differ between the locations. However, because of the small number of discrepant findings between 3D TOF MRA and DSA, reliable interpretation of the results is not possible. The mean size of the aneurysms was 7.5 ± 5.1 mm (range, 2–40 mm). Aneurysm size with regard to the aneurysm location is given in Table 3. Aneurysms of the AcomA were significantly smaller than aneurysms of the ICA (5.7 ± 3.2 versus 10.4 ± 7.7 mm, P < .001). The mean aneurysm size did not significantly differ among the other locations. The number of disagreements between MRA and DSA was significantly higher in aneurysms 3 mm or smaller compared with those larger than 3 mm (7/33 versus 9/155, χ2 = 8.3, df = 1, P < .01, Table 4). No significant difference was found between the number of disagreements for aneurysms 5 mm or smaller compared with aneurysms larger than 5 mm (8/73 versus 8/115, χ2 = 0.9, df = 1, P > .05, Table 4). All misinterpretations (16/188, 8.5%) occurred in aneurysms 12 mm or smaller. Sensitivity and specificity values and corresponding 95% confidence intervals were calculated for aneurysms smaller than 5 mm and smaller than 3 mm separately (Table 4). Disagreements between MRA and DSA occurred in 7 (9.1%) of 77 unenhanced studies and in 9 (8.1%) of 111 contrast-enhanced studies (Table 5). The number of misinterpretations was not significantly different between the groups (χ2 = 0.06, df = 1, P > .05). Sensitivity and specificity values of unenhanced MRA versus contrast-enhanced MRA were 88.9% (95% CI, 70.1–97.6) versus 88.2% (95% CI, 72.6–96.7), and 92% (95% CI, 80.8–97.7) versus 93.5% (95% CI, 85.5–97.7), respectively. There weren't any statistically significant differences between unenhanced and contrast-enhanced studies concerning the number of misinterpretations of aneurysms ≤3 mm (3/11 versus 4/19, χ2 = 0.001, df = 1, P > .05) and aneurysms >3 mm (4/63 versus 5/92, χ2 = 0.06, df = 1, P > .05). Furthermore, no statistically significant difference between unenhanced and contrast-enhanced studies was found concerning the number of misinterpretations of aneurysms ≤5 mm (3/30 versus 5/43, χ2 = 0.05, df = 1, P > .05) and aneurysms >5 mm (4/47 versus 4/68, χ2 = 0.3, df = 1, P > .05). In the current study, the overall sensitivity and specificity of MRA in detection of residual or reperfusion of coiled intracranial aneurysms was 88.5% and 92.9%, respectively. This is in line with previous studies considering 3D TOF MRA to be a reliable alternative to DSA for follow-up of coiled intracranial aneurysms.1–9 However, the diagnostic accuracy of TOF MRA seems to be significantly related to the size of the aneurysms. 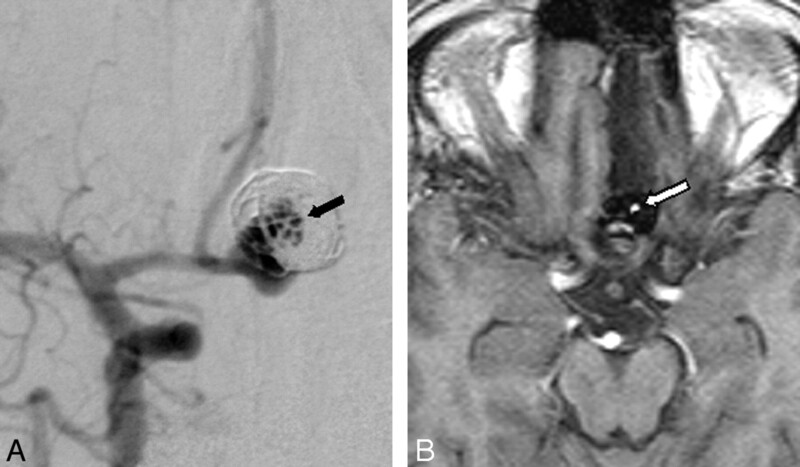 Several studies suggested a size of 3 mm or smaller to be critical for detection of intracranial aneurysms.11–14 Artifacts related to complex or slow flow, flow stasis, or recirculation are more pronounced in small aneurysms.17 The reported sensitivities for detection of aneurysms 3 mm or smaller reach from 25% to 55%.11,12 In our study, the sensitivity for detection of aneurysms 3 mm or smaller significantly lower compared with aneurysms larger than 3 mm (63.6% versus 94%; Table 4). Furthermore, although not statistically significant, there was a trend toward a higher number of disagreements between TOF MRA and DSA in aneurysms ≤5 mm (8/73, 11%) compared with aneurysms >5 mm (8/115, 7%, P = .3). Thus, the sensitivity for detection of aneurysms ≤5 mm was lower compared with aneurysms >5 mm (72.2% versus 95.3%, Table 4). The small aneurysm size may also have influenced the interpretation of MRA of the PcomA. Two (8.7%) small aneurysms of the PcomA were misinterpreted by MRA. In 1 aneurysm (3 mm), susceptibility artifacts caused by air/bone interface at the region of the sella turcica and the sphenoid sinus may have led to the misinterpretation. In the other case (aneurysm size 5 mm), slow flow within the parent artery may have hampered visualization of the perfused aneurysm neck. Twenty-three aneurysms were located at the BA. Two of these aneurysms were considered occluded in MRA, whereas DSA showed a small residual perfusion of the aneurysm neck. Again, these misinterpretations may be attributed to the small size of the aneurysms (2 and 3 mm, respectively). In addition, pulsation-induced artifacts may have led to a false-positive interpretation of 1 larger aneurysm (size 10 mm). However, sensitivity and specificity values were 83.3% and 90.9%, respectively. Image interpretation in the ICA may be difficult because of flow loss in the siphon, overlap of the aneurysm and adjacent arteries, or atherosclerotic changes in the parent artery that may cause turbulent flow.8,10 A previous study evaluating 3D TOF MRA for detection of intracranial aneurysms of the ICA reported a sensitivity of 47% to 71%.11 In our study, aneurysms of the ICA were significantly larger than aneurysms of the AcomA, and the mean size was the largest of all locations. There were only 2 (4.8%) misinterpretations, possibly caused by pulsation-induced artifacts and vessel overlap due to a kinking of the artery. Thus, sensitivity and specificity values were high (93.3% and 96%). The only misinterpretation of an aneurysm of the MCA may be attributed to a kinking of the parent artery causing a false-positive result. Only 3 (1.7%) aneurysms were located at the posterior inferior cerebellar artery and only 1 (0.5%) aneurysm was located at the vertebral artery. TOF MRA correctly diagnosed residual perfusion in 2 of these cases and complete occlusion in the other 2 cases. In contrast to previous studies, in only 2 cases (PcomA, n = 1; BA, n = 1) were there misinterpretations as a result of signal intensity loss generated by blood flow. In previous reports, failure in identifying a residual neck on MRA was attributed to this effect.7,10 The use of contrast-enhanced MRA may increase the diagnostic accuracy of MRA in these cases.3 However, Boulin et al4 reported that the sensitivity and specificity rates of gadolinium-enhanced 3D TOF MRA for detection of residual aneurysms were 72% and 98%, respectively. These values were not significantly different compared with unenhanced MRA. Contrast-enhancement may also reduce saturation effects on 3D TOF MRA,3,4,7 improving the visualization of large remnants or recurrences of aneurysms treated with coils.3 However, it may also be disadvantageous. According to Anzalone et al,3 contrast-enhanced TOF MRA does not seem to be indicated for small aneurysms or small aneurysms located near the base of the skull, where enhancement of veins can interfere with evaluation of adjacent arterial vessels.3,20,21 In our study, no saturation effects were observed. In 5 cases, vessel overlap may have caused the misinterpretation between MRA and DSA. In 3 of these cases, contrast material was applied. However, in none of these cases did venous overlap degrade image interpretation. Unenhanced TOF MRA is reported to be of less value for detection of residual flow in giant aneurysms.3,15,16 In our study, 9 of 188 (4.8%) aneurysms were 20 mm or larger. Contrast-enhancement was used in 4 of these studies. In none of these cases did misinterpretations occur. However, 1 giant aneurysm had to be excluded from data analysis because TOF MRA was nondiagnostic as a result of extensive flow artifacts. In this case, the use of contrast enhancement may have improved image quality. The distribution of false-positive and false-negative findings of MRA compared with DSA did not prove to be significantly different with regard to aneurysm location. This may be caused by the small overall number of misinterpretations distributed across 8 different locations. Although the sensitivity and specificity values suggest differences between some of the locations, the corresponding 95% confidence intervals seem to be too wide for reliable interpretation of these values (Table 1). Several limitations to the study must be considered. First, the study shares the limitations of all retrospective studies. In 5 cases, interpretation of MRA images proved to be difficult. In these cases, a consensus reading had to be performed to reach agreement between the 2 readers. These cases might have been misinterpreted in the routine clinical setting. Second, the study included only a small number of large and giant aneurysms. Therefore, conclusions about diagnostic accuracy of TOF MRA in this type of aneurysm should be drawn with reservation. Third, because of the small number of misinterpretations of MRA compared with DSA, statistical evaluation of the possible influence of aneurysm location on the diagnostic accuracy of MRA proved to be of limited value. In conclusion, the sensitivity of 3D TOF MRA for detection of reperfusion or residual perfusion of coiled intracranial aneurysms varies considerably depending on the size of the aneurysms. In agreement with previous studies, the sensitivity and specificity of MRA was lower in aneurysms ≤3 mm. However, 3D TOF MRA may safely be used for follow-up of coiled intracranial aneurysms larger than 3 mm. Furthermore, because of the small number of discrepant findings between MRA and DSA, no conclusions can be drawn regarding a possible influence of aneurysm location on diagnostic accuracy of 3D TOF MRA. These results may influence the decision whether to replace DSA by 3D TOF MRA for the follow-up of patients with intracranial aneurysms treated with GDCs. However, large prospective trials are necessary to further elucidate the role of 3D TOF MRA for follow-up in these patients. Accepted after revision July 8, 2006.